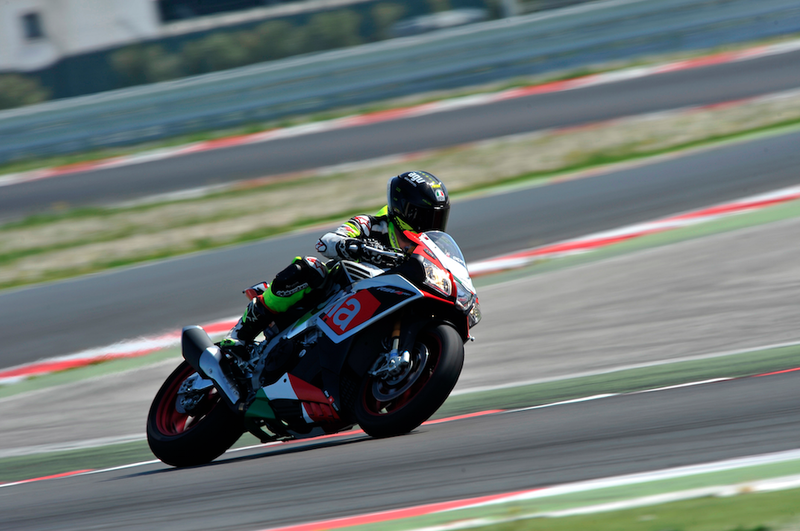 We shot out to Misano to ride the new Aprilia RSV4 RF and the new Aprilia Tuono. We’ll be trickling features and a full riding review of both bikes onto SuperBike.co.uk over the next few weeks. 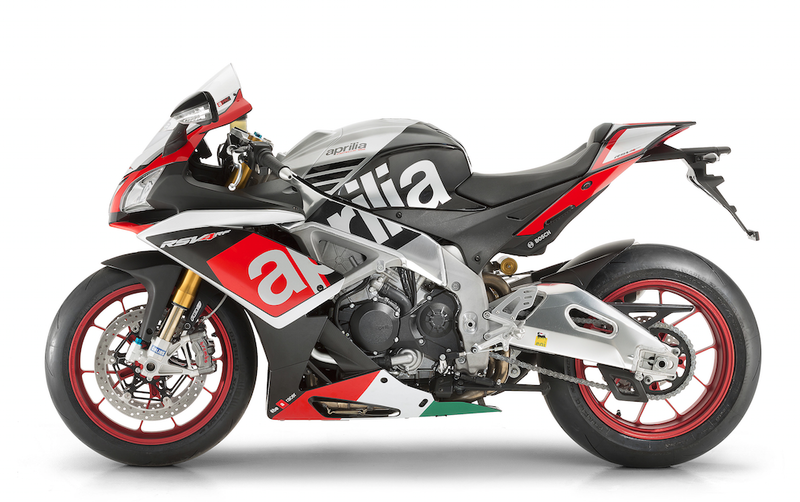 If you saw Leon Haslam battling for a podium at Assen on the Aprilia SBK at the weekend and want a bike just like his, the new Aprilia RSV4 RF is as close as you’ll get. 160mph selfie? Step this way. Just 500 RSV4 RF available. 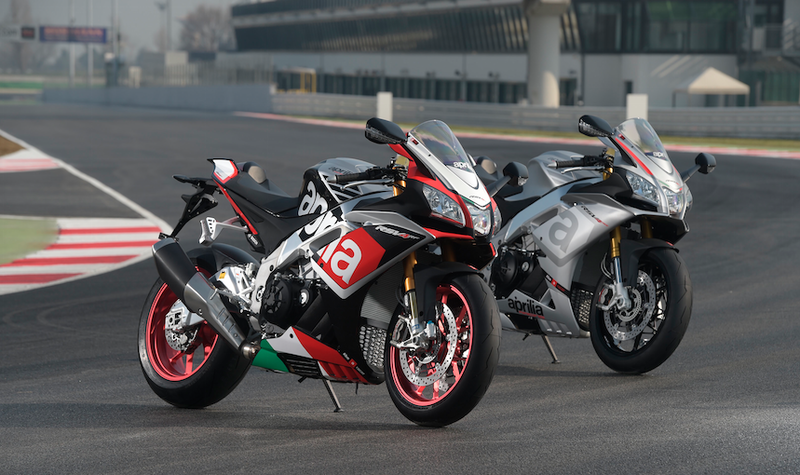 The Aprilia RSV4 RF has been limited to just 500 units worldwide. At £18,135 it’s certainly not cheap. But you get your money’s worth. Öhlins forks, shock and steering damper, Brembo M430 monobloc brakes up front and a Brembo radial mount master cylinder are all peachy and work as well as they look. Power is up on the 999cc V4 four-stroke. 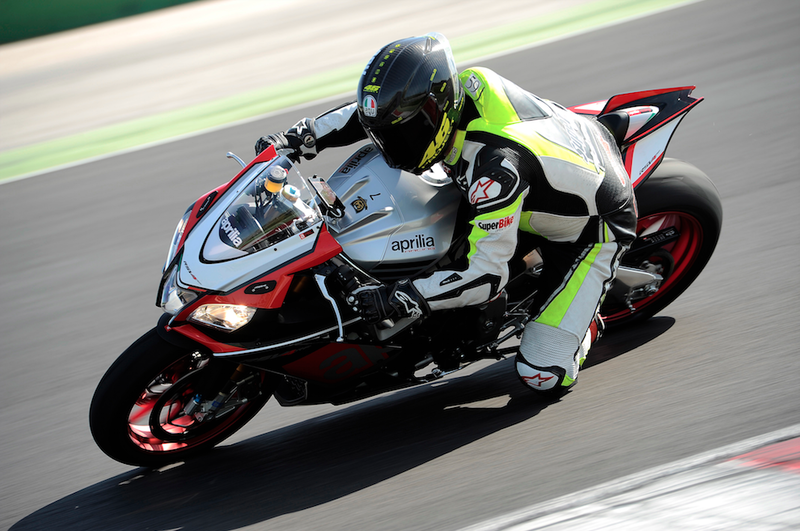 Aprilia are claiming 201bhp at 13,000rpm and 115Nm torque at 10,500rpm. It’s worth noting that these figures are quoted at the camshaft and not at the wheel. The adjustable swingarm might not ever get adjusted, but in owning an RSV4 RF, you’ll have one of the most adjustable and exclusive road bikes money can buy. The swanky little plaque mounted on the headstock will remind you which of the 500 you own. Traction control that you can’t feel working, perfect. 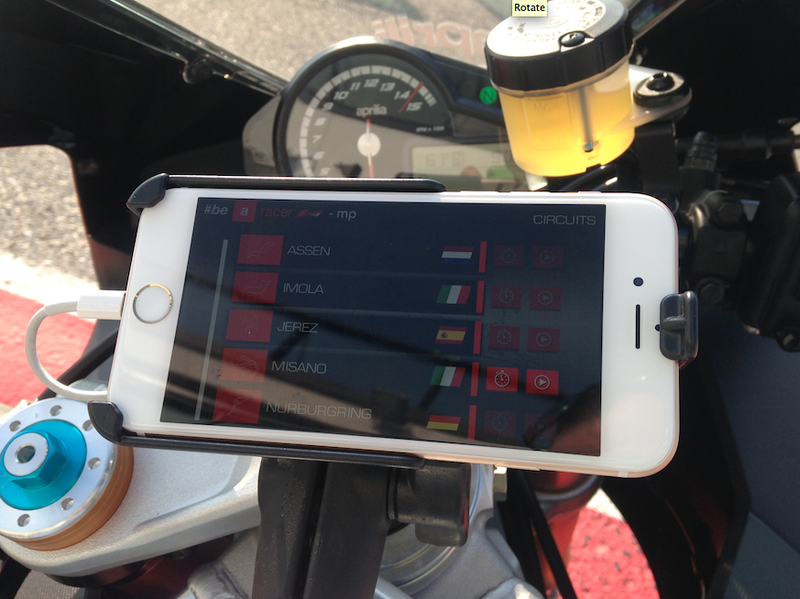 The APRC (Aprilia Performance Ride Control) system is one of the best ride management systems available on a production motorcycle. Ride by wire (RbW), Launch control (aLC), a quick shifter (aQS) and wheelie control (aWC) all play their part in making your ride as smooth and as fast as possible. If you have experience of other traction control systems, you’ll know the feeling can sometimes knock your confidence and slow you down. Some systems seem to jerk the bike about as they cut in and out, not so on the Aprilia. You’ll get little more than a flashing light to let you know that something is going on underneath you. On the fly adjustment to the traction control is easy thanks to the buttons mounted on the left hand clip on. As per the previous generation RSV4, the APRC on the RF is a fantastic system, perfectly in tune with the bike, relatively easy to navigate around to set up and possibly the best standard fit system you’ll find on any of the current crop of litre sports bikes. RSV4 RF and RR. Either one would paint a smile on all but the sourest of faces. The RR is the bike that replaces the APRC ABS and the RF is essentially the bike that replaces the Factory model that you might be used to. The new RR has a mountain of changes. The highlight of which has to be the claimed power increase of 16bhp at 8,000rpm. Far from being an explosive one trick pony, the host of changes made to the RSV4 seem to further enhance the appeal of last year’s model at the same time as adding enough for you to justify slapping your cash down on a brand new bike, rather than a year old used model. Suspension adjustment helped lap quicker, who knew? Despite all the electronics, playing with the suspension makes this bike quicker. Braking at the end of the straight-line sections at Misano circuit, I found the back end of the bike wanted to skip a little and slide about. I followed quicker riders than me that were happy to put up with it and were able to bang the bike onto its ear without anything bad happening. My fast group skillset is a little more real world and I found the waggling rear was causing me to panic brake and turn in late. This was causing me to get arm pump, which was slowing me down everywhere. A quick chat to the team in the pits and some changes were made. Two extra clicks of compression damping at the rear and a single turn of extra compression damping at the front yielded an extra three seconds a lap. This time was gained through a combination of suspension changes, track and bike familiarity and suddenly realizing that there was a stopwatch on the phone mounted to the bike that was keeping an eye on me.